When asked by the author himself if I would like a free copy of his new book for review, did you actually think I would say no? Even if I did not particularly want to write this review, it would be foolish of me to say no to a freebie from a self-professed “Stingy Scoundrel”. So, thank you to Phil Villareal (the author) and Skyhorse publishing for the free swag. 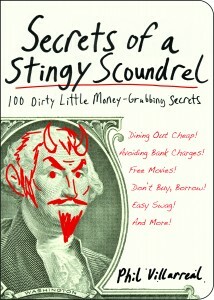 Secrets of a Stingy Scoundrel could not be more aptly named. Within these pages lie some of the most despicable and outrageous ways to save money you could ever imagine, many that even border on illegal. Now, I am a relatively hard person to shock or offend. Anyone who knows me personally also knows that I am gross, inappropriate, idiotic and almost completely desensitized to everything. This book shocked me. I was unprepared for just how money-grubbing and unethical the tips in this book would be. Add to that the writing style (which is uproarious) and what you get is a book that sucked me right in. I would love to say that I did not like Secrets, but I enjoyed every second of it! Even those tips that I completely disagree with on a moral basis (like taking post-it notes to the grocery store with made-up prices for the store to match) are delivered with such wit that it is hard to even be irritated. It takes a special kind of writer to tell you to basically steal from a company and do it with a sense of humor that makes you laugh out loud as you sit alone on the porch, book in hand. I recommend at least four, I-never-wanna-see-you-again (till next week) throw-downs. Valentine’s day, her birthday, your anniversary, and Christmas. Throw Thanksgiving in there too if her parents annoy you and she’s asked you to dine with your family. I am fortunate that I can recognize what should be taken seriously and what is meant to be funny. But it is a VERY fine line. What may be too “over the top” for me may just be an idea or method you will gladly be willing to adapt. If you are looking for tips that will genuinely save you money, and morals have no boundaries, get this book. If you just want to laugh, and could care less about how stingy the author really is, get this book. On the other hand, if you are easily offended by almost anything at all, this one is not for you. Don’t say I didn’t warn you. This is one very entertaining book. Previous post: Have Young Children? Use Cash to Teach Financial Lessons. Next post: Using Yard Sales for Side Income-Fun? Yes. Difficult? Definitely.